In April 2019, Leyden Academy researchers Frank Schalkwijk and David van Bodegom published a Letter to the Editor in the high-impact journal JAMA Cardiology, in response to a study that showed that the gradual increase of blood pressure with age is inappropriately considered a normal characteristic of ageing. Schalkwijk and Van Bodegom argue that the finding that in Western populations the increase of blood pressure starts at early ages indicates that entire Western populations are at high risk for hypertension and cardiovascular disease. Nevertheless, in current high-risk strategies that prevail in medical practice, we wait until an individual exceeds a certain cutoff point to consider them to be at risk. This strategy has been proven effective, but for further reducing the incidence of cardiovascular disease, treating high-risk individuals even more intensively might not be the most fruitful strategy. Therefore, health care professionals should focus more on the population level societal determinants of a healthy lifestyle in addition to prevailing prevention policies that primarily rely on high-risk strategies. Read the full article here: Absence of the Association of Blood Pressure With Age in a Remote Venezuelan Population Renews the Call for Population-Wide Interventions. People across the globe share many of the same wants and needs as they grow older. This is why the AARP, America’s largest organization dedicated to empowering seniors to choose how they live as they age, also looks abroad for inspiration, innovations and insights. In the annual publication The Journal, the AARP showcases thought leadership around the globe concerning all issues related to ageing, to share promising ideas so that others might be inspired and even build off them. Each year, a specific country is explored in-depth to better understand its approach to the ageing challenge. After Japan in 2018, the AARP now decided to focus on The Netherlands, one of the small, innovative economies featured last year in the AARP’s Ageing Readiness and Competitiveness Report. The special feature in The Journal offers a multifaceted image of ageing in the Netherlands. In a prologue, Hugo de Jonge, the Dutch Minister of Health, Welfare, and Sports, discusses how ageing in place, nursing care, and social isolation are all connected, and explains how the government aims to empower civil society, social enterprise, and companies to work together to improve care and support to seniors. Professor Joris Slaets of Leyden Academy introduces a typical Dutch older couple, Wim and Ineke, to paint a picture of what growing older in the Netherlands looks like. 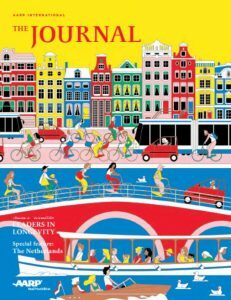 The Journal also includes profiles of intergenerational care community Humanitas Deventer, nursing farm De Reigershoeve, the iZi Living Lab, the Dutch cycling and volunteering culture, the age-friendly and ‘super-diverse’ city of The Hague, and many more. The Journal also introduces some older Dutch persons, like 79-year old Hans Ulrich from Oegstgeest. A picture gallery depicts ‘a day in the life’ of Hans, who represented the Leyden Academy in 2018. You can see him smoking his pipe in his garden, walking to the mall with his grandson and enjoying a pickled herring as a savory snack. You can find the 2019 edition of The Journal on the AARP website or download the full report here (pdf file). For a direct link to the contribution of Professor Slaets, please click here. Today Leyden Academy hosted the IMISCOE conference, with the aim to bridge state-of-the-art research and practice on the care for and social well-being of older migrants. The morning session focused on the complex interconnections of different forms of care provided by various individuals and organisations in local places (the private home, the neighbourhood, care institutions). Long-term care is increasingly decentralised to the local level, boosting new combinations of informal family care, professional care and volunteer work. On the basis of recent research from the Netherlands and Switzerland, the session explored the implications of this development for older migrants, providers of mainstream and specialised care services, and policymakers. The afternoon session focused on different aspects of older migrants’ social well-being in the Netherlands. Although it is often referred to, the social domain of well-being remains secondary to issues of health and provision and quality of care for older migrants. This session explored which aspects of well-being are common to current research, debates and practices. and which aspects older migrants themselves acknowledge as important. The three key social themes of well-being were: loneliness, social participation and transnational living. The technical guidance Health of older refugees and migrants was released in November 2018 by the WHO Regional Office for Europe. The report aims to inform policy and practice development specifically related to improving the health and wellbeing of older refugees and migrants in Europe. Ageing and migration are complex multidimensional processes, shaped by a range of factors at the micro, meso and macro levels over the life-course of the individual. Responding to the needs of older refugees and migrants, must therefore be integrated into all dimensions of ageing policies and practices across Europe. Author of this important report is Maria Kristiansen, Associate Professor at the Center for Healthy Aging and the Department of Public Health, University of Copenhagen. The WHO technical guidance report includes several ‘promising practices’, including a project from Leyden Academy (page 21) regarding people-centered engagement of older migrants in health and long-term care. It features the Life and Vitality Assessment (LAVA), an instrument to map and discuss what older people find important in their lives. We are in the process of developing a version of the LAVA specifically for older migrants, based partly on the insights we obtained from a series of focus groups in 2018 among the largest non-Western migrant groups in the Netherlands. For more information, please visit the WHO Regional Office for Europe website. Whitepaper: Why do we retire? Aegon Center for Longevity and Retirement (ACLR) is publishing a series of four whitepapers to broaden the view on retirement, beyond the traditional financial scope. The series is one of the results of the long-lasting cooperation between Aegon and Leyden Academy on Vitality and Ageing. The first whitepaper was released today and examines the question: Why do we retire? Retirement is not simply a financial issue; it is a phase of life where people aspire to stay socially connected, participate in their communities, and remain economically active. Therefore, research areas that deal with the connection between retirement and important aspects of later life such as health, vitality, life satisfaction and the image of elderly can contribute to helping people prepare for retirement and their societal position and engagement after retirement. For this reason, ACLR has invited the researchers of Leyden Academy on Vitality and Ageing to help reflect on retirement from different academic angles, and inspire Aegon to encourage the debate on retirement beyond the economic aspects. This first whitepaper ‘Why do we retire?’ explores the various wishes and ambitions that people have for retirement, based on the combined results of the surveys of Aegon Center for Longevity and Retirement and Leyden Academy. You can read the whitepaper on the Aegon website, accompanied by a personal reflection on the issue by Mike Mansfield, Program Director at ACLR. In the three whitepapers that follow in 2019, we will further broaden the view on retirement from the perspectives of health and vitality, well-being and life satisfaction, and finally the image of retirement and retirees. On Tuesday 19 February 2019 the IMISCOE conference ‘Care for and social well-being of older migrants’ will be held in Leiden. In the Netherlands, the number of older adults with a migration background is growing rapidly. Due to cultural, socio-economic and demographic differences with nonmigrant older adults, older migrants generate specific care demands as well as a need for new interventions and facilities aimed at their well-being. The conference will focus on the exchange of knowledge between researchers, professionals and policy makers in care and welfare. The researchers will present and discuss with the participants practical applications of recent research into local aspects of care for older migrants, including district-oriented work and family care, and aspects of social well-being, including loneliness, social participation and transnational relations. There will be room for supplying suggestions for follow-up research and to further strengthen the link between research and practice. For the full program and details about location please refer to the brochure. The official language is English, and participation is free. The number of places is limited so quick registration is advised. AARP released its 2018 Aging Readiness and Competitiveness (ARC) research, which examines how prepared nations are for the challenges and opportunities presented by a rapidly aging population. This year, the research examined Australia, Chile, Costa Rica, Lebanon, Mauritius, the Netherlands, New Zealand, Norway, Singapore and Taiwan. Based on global research conducted by FP Analytics, 2018 ARC plays out against a dramatic, global demographic shift already underway. By 2030, there will be nearly one billion people ages 65 and older around the world, a group that between 2015 and 2030 will grow at four times the rate of the overall global population. The inaugural 2017 ARC report established a baseline understanding of the state of global aging policies, with in-depth assessments of a group of 12 countries that are geographically, culturally, and socioeconomically diverse and that, together, represent 61 percent of the global GDP and nearly half of the world’s population of people ages 65 and older. For the 2018 ARC report, the focus shifted to 10 small economies around the world that are leading their regions in responding to demographic change. As in 2017, countries were assessed on four pillars: 1. Community Social Infrastructure, 2. Productive Opportunity, 3. Technological Engagement and 4. Health Care & Wellness. Among the notable findings in the 2018 ARC: The World Health Organization’s Age-Friendly Cities initiative has been adopted in seven of the 10 2018 ARC nations with Taiwan most strongly embracing the model and deploying it in more than 20 of the nation’s largest cities. While providing access to affordable, high-quality health care remains a vexing, much-debated challenge in the U.S., it is cited by the majority (54 percent) of respondents from 2018 ARC nations as the area in which their nation is strongest, with nine of 10 ARC nations (all but Lebanon) having instituted universal health care coverage. Additionally, health care and wellness was cited by 38 percent of respondents as the category that has seen the greatest improvement in their nation over the last three to five years. As countries increasingly digitize government services, the ARC found that the risk of digital exclusion is only growing, making targeted outreach and training for older adults vitally important. Despite considerable satisfaction among 2018 ARC respondents with progress made in their nation around the provision of health care, dementia is nearly uniformly seen as a hurdle. With lifespans extending and the prevalence of dementia growing dramatically, all 2018 ARC countries except Lebanon and Mauritius have national plans to manage dementia. AARP is the nation’s largest nonprofit, nonpartisan organization dedicated to empowering people 50 and older to choose how they live as they age. With a nationwide presence and more than 38 million members, AARP strengthens communities and advocates for what matters most to families: health security, financial stability and personal fulfillment. AARP also produces the nation’s largest circulation publications: AARP The Magazine and AARP Bulletin. To learn more, visit www.aarp.org. Leiden, The Netherlands, 25 September 2018 – Every doctor will face terminally ill patients. How can dying be properly addressed and discussed in medical practice? What does good care entail in the final phase of life? Researchers at Leyden Academy on Vitality and Ageing reviewed to what extent end-of-life care (ELC) is represented in the Dutch medical curricula. The education offered is very diverse and the subject remains underrepresented, the researchers conclude in an article published on 5 September in academic journal Perspectives on Medical Education. Future doctors need to be trained in providing appropriate care to terminal patients. In many countries, medical curricula have been reviewed for the attention devoted to ELC. In the Netherlands, no formal review had been performed. The researchers first designed a checklist based on international standards consisting of five domains of ELC education that are considered essential, such as communication skills, juridical and ethical aspects, and self-reflection on experiences with death and loss. The checklist was used to review the Dutch Framework for Undergraduate Medical Education, which serves as a blueprint for medical education in the Netherlands. Secondly, the bachelor and master curricula and elective courses of the 8 Dutch medical faculties were studied. Is ELC being addressed, and if so how, in what educational form is it taught? The researchers conclude that there is much room for improvement. The Framework for Undergraduate Medical Education includes four of the five domains of ELC and describes the ELC-domains only superficially. None of the eight medical faculties taught all domains specifically on ELC; they were taught within other courses. Only one faculty offered an elective course that includes all essential aspects of the international standards. For more information, please contact Niels Bartels (communications manager) by phone +31 (0)71 524 0960 or by email. Each year, alternatingly the portrait of a vital older man or woman is chosen to represent our institute on communication outings (e.g. for website, brochures, banners etc.). For this year, from 11-11-2018 through 11-11-2019, we are looking for a woman (from 75 years or older) who radiates a lust for life. Several photos of multiple persons may be submitted. The management and communication department at Leyden Academy will choose the ‘winning’ portrait. The picture is royalty-free and will be used by Leyden Academy. Photos can be submitted up to the end of September 2018 to Yvonne Schinkel-Koemans at koemans@leydenacademy.nl. Today, the EPIcenter Summer School on Healthy Living and Happy Ageing kicked off. In a two-week programme, thirty students will work on solutions for real-life challenges, aimed to improve the quality of life of (vulnerable) older people. After a successful first edition last year in Heidelberg, Germany, the students are now welcomed at Leyden Academy. EPIcenter is a Summer School of EIT Health and is organised by Leyden Academy, the LUMC, Zilveren Kruis, Universität Heidelberg en Ireland Smart Ageing Exchange (ISAX). The students have come to Leiden from all over the world: from Spain, Russia, China, Germany, The Netherlands, Romania, Taiwan, India, Iran, Sweden, Ecuador, Portugal, Croatia, Pakistan, France, Indonesia, and even Australia. The five teams will go through the full cycle of state of the art innovation methods to develop creative, practical solutions for the challenges submitted by organisations like Aegon, Espria, Achmea Zilveren Kruis and the municipality of Leiden. The teams are supported by coaches, mentors and experts. For more information, visit the Summer School website or follow the latest developments on Twitter.